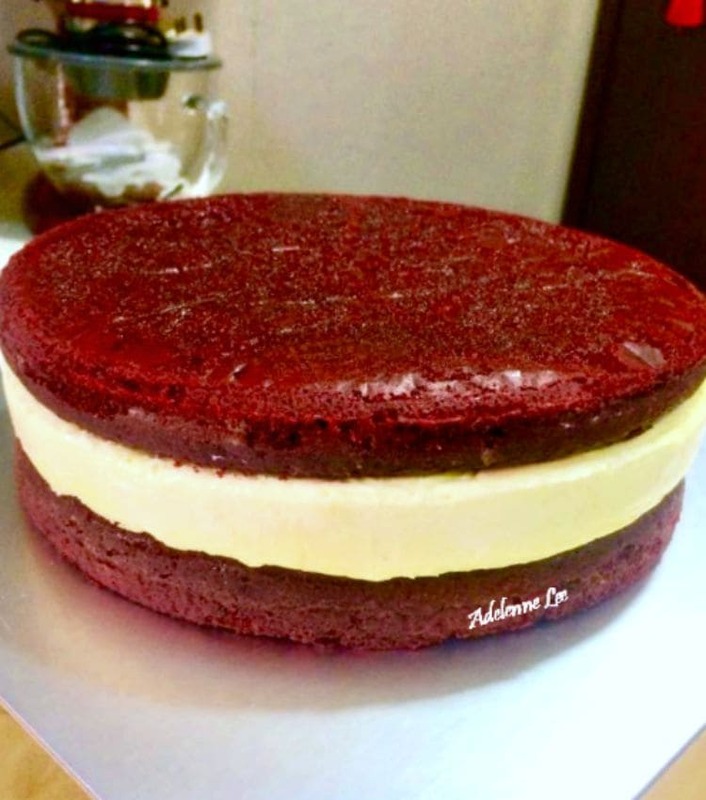 RED VELVET CAKE CHEESECAKE. It's a BIG WOW! Lovely vanilla cheesecake sandwiched between soft red velvet cakes and then topped with a light, fluffy puffy whipped cream frosting. It really is a WOW! RED VELVET CAKE CHEESECAKE. It’s a BIG WOW! Lovely vanilla cheesecake sandwiched between soft red velvet cakes and then topped with a light, fluffy puffy whipped cream frosting. It really is a WOW! RED VELVET CAKE CHEESECAKE. Oh boy! This recipe is a show stopper! 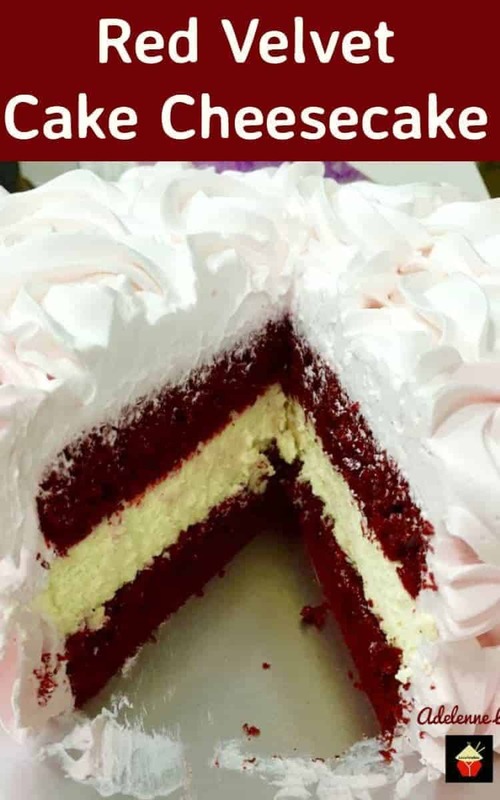 This delicious Red Velvet Cake Cheesecake recipe has been generously shared by one of our great cooks, Adelenne. She’s always coming up with great recipes which she either invents herself or adapts from various cookbooks to make her own. 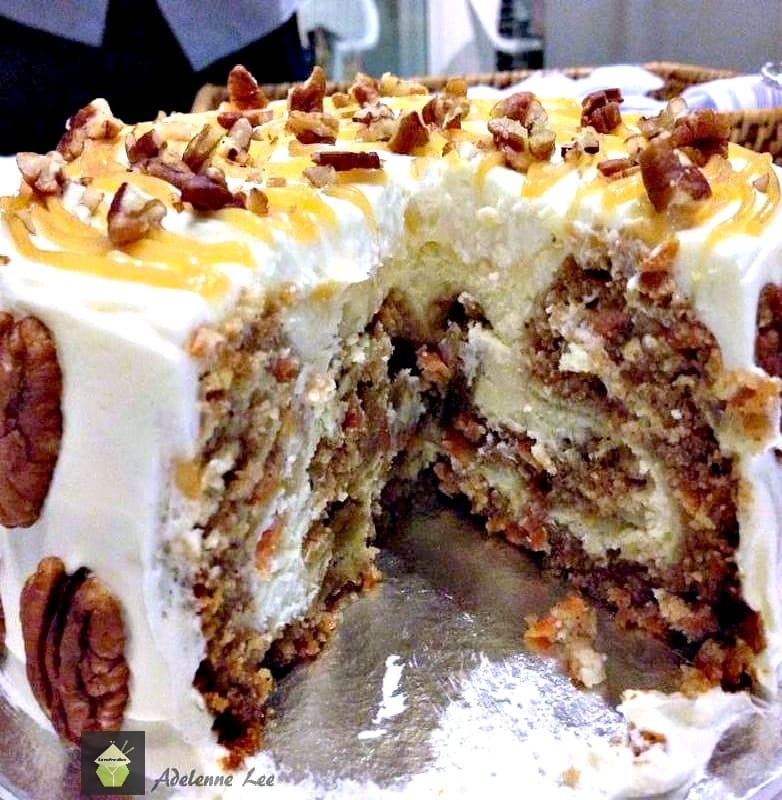 Adelenne has always got a tasty recipe or two to share with us. 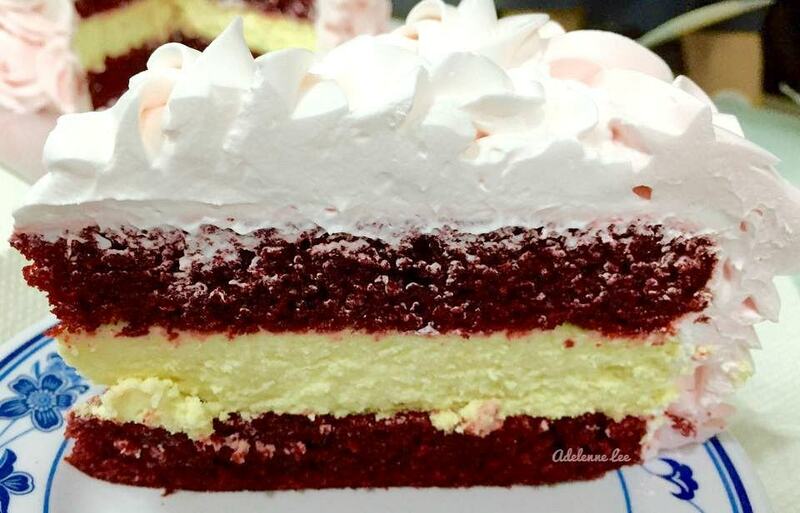 Here, we have Adelenne’s recipe for her Red Velvet Cake Cheesecake, and oh boy! It has wonderful ingredients! 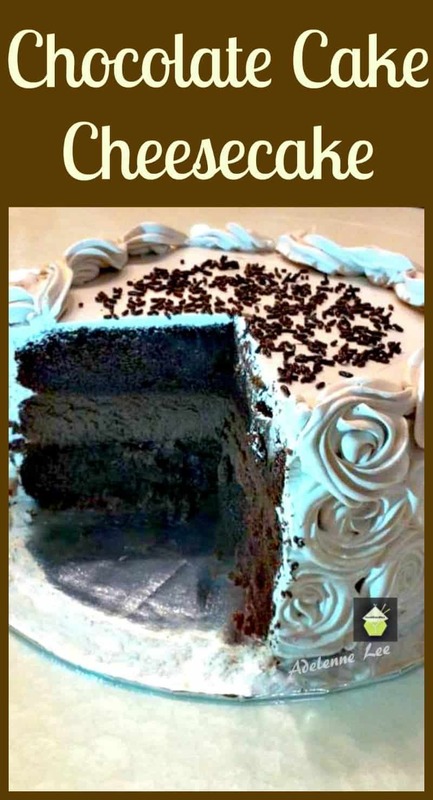 The cake itself is easy enough to make and is very moist. The addition of the Whipped cream frosting compliments the cake and together with a nice cup of tea, you have a perfect tea time treat! 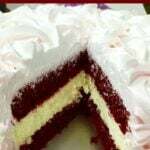 This Red Velvet Cake Cheesecake is a perfect cake for a celebration such as a birthday, wedding, Eater or Christmas time. It certainly is a show stopper, and add some candles or sparklers when you’re ready to serve for an added celebration touch! 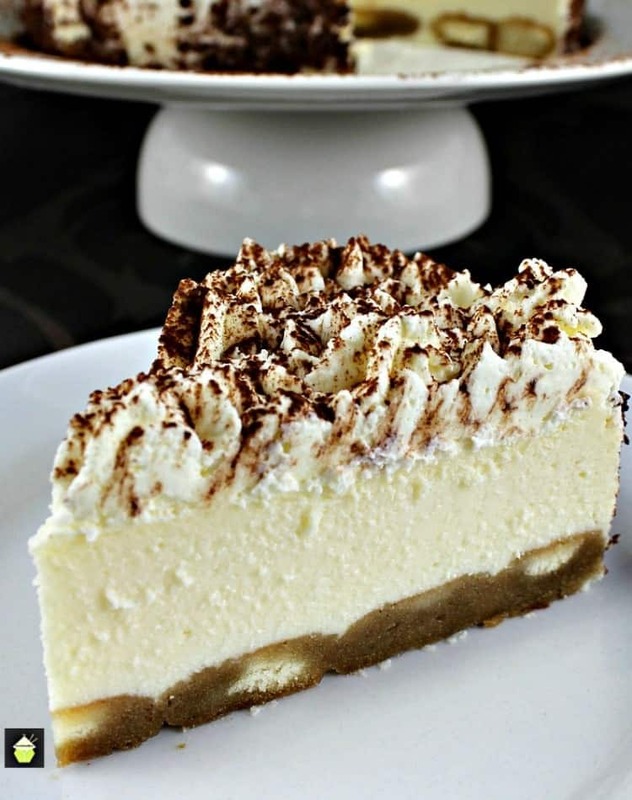 Be sure to check out our other lovely cheesecake recipes. They’re so delicious! Cook Time: 40 – 45 minutes Approx. 2. In a mixer, beat cream cheese until smooth and creamy. Add salt and sugar and blend for about 2 minutes. Add eggs, one at a time, scraping down when necessary. 3. Mix in sour cream, whipping cream and vanilla. 4. 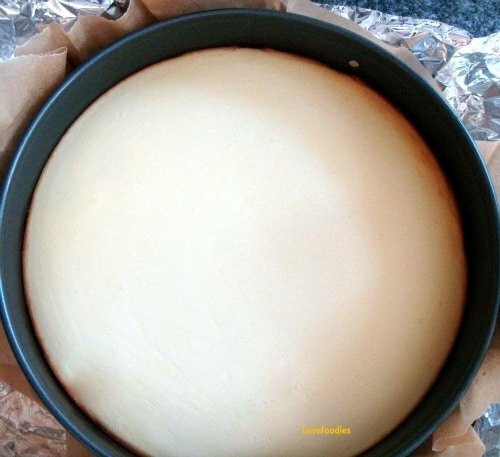 Pour into prepared tin and place in a water bath (a larger tray filled about 1 inch up the cheesecake tin). 5. Bake for 45 minutes until set. Remove from roasting pan and let cool completely and freeze for 3 – 4 hours or better, overnight. 6. Make the cake, Preheat oven to 170 C, 325 F. Line and grease two 9 inch round tins. 7. In a mixer, whisk flour, salt baking soda, cocoa powder and sugar. Add vinegar, buttermilk, eggs, vanilla, oil and food colouring. 8. Beat on low for 1 minute, scraping down and beat on high for another 2 minutes. Divide evenly into the prepared tins and bake for 35-40 minutes until a skewer comes out clean. 9. Cool and remove from tins. Wrap and chill in fridge until ready to assemble. 10. To assemble, remove cheesecake from freezer. 11. Run a hot knife under hot water and run it around the inside edge of tin. Release springform tin. Level off the 2 baked cakes to get an even top. 12. Place one cake on a plate. Place cheesecake on top of cake. Trim down cheesecake if it’s bigger than cake. Place the 2nd cake on top of cheesecake. 13. Set aside to chill in the fridge and prepare frosting. 14. Make the frosting – Put gelatin and water in a small bowl. Microwave at 15-second intervals to dissolve the gelatin. 15. Add about 2 Tablespoons of whipping cream in and stir. Set aside. 16. Put the remaining whipping cream in the mixer and beat till soft peaks. Add sugar and vanilla. ( add the desired coloring). Beat for a minute and add in gelatin mixture and beat till stiff peaks. 17. Remove cake from fridge and crumb coat the cake. Chill for 20 mins. 18. Using a piping bag fitted with an open star tip, frost the whole cake with rosettes. Here’s a few more lovely Cheesecake recipes for you to enjoy! In a mixer, beat cream cheese until smooth and creamy. Add salt and sugar and blend for about 2 minutes. Add eggs, one at a time, scraping down when necessary. Mix in sour cream, whipping cream and vanilla. Pour into prepared tin and place in a water bath (a larger tray filled about 1 inch up the cheesecake tin). Bake for 45 minutes until set. Remove from roasting pan and let cool completely and freeze for 3 - 4 hours or better, overnight. Make the cake, Preheat oven to 170C, 325 F. Line and grease two 9 inch round tins. In a mixer, whisk flour, salt baking soda, cocoa powder and sugar. Add vinegar, buttermilk, eggs, vanilla, oil and food colouring. Beat on low for 1 minute, scraping down and beat on high for another 2 minutes. Divide evenly into the prepared tins and bake for 35-40 minutes until a skewer comes out clean. Cool and remove from tins. Wrap and chill in fridge until ready to assemble. To assemble, remove cheesecake from freezer. Run a hot knife under hot water and run it around the inside edge of tin. Release springform tin. Level off the 2 baked cakes to get an even top. Place one cake on a plate. Place cheesecake on top of cake. Trim down cheesecake if it's bigger than cake. Place the 2nd cake on top of cheesecake. Set aside to chill in fridge and prepare frosting. Make the frosting - Put gelatine and water in a small bowl. Microwave at 15 second intervals to dissolve the gelatin. Add about 2 Tablespoons of whipping cream in and stir. Set aside. Put the remaining whipping cream in mixer and beat till soft peaks. Add sugar and vanilla. ( add desired coloring). Beat for a minute and add in gelatin mixture and beat till stiff peaks. Remove cake from fridge and crumb coat the cake. Chill for 20 mins. 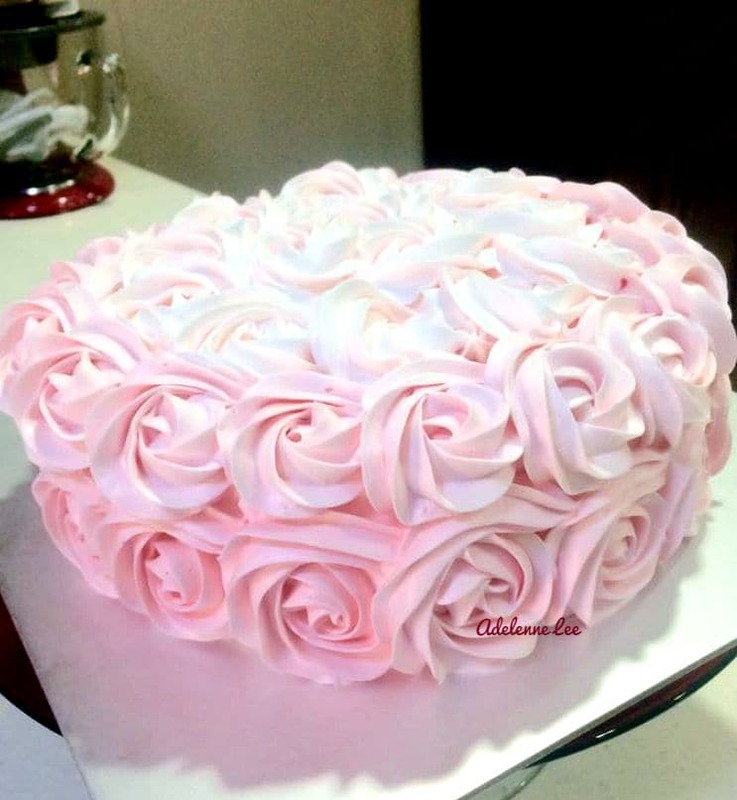 Using a piping bag fitted with an open star tip, frost the whole cake with rosettes. Please note, times include chilling time. What a wonderful cheesecake – it looks beautiful and so delicious too!